Kind of like unlimited Gan but way more dangerous and unhinged. This week somebody other than Christ Boucher or Terry Nation titled the script, because it’s got like 4 words. Thats 3 words more than the average on this show, so let’s give Blake’s 7 a big round of applause. It’s Voice from the Past, written by Roger Parkes, and aired on March 13, 1979. 0:57 Making Blake’s 7 is a Twitter account about the making of Blake’s 7. 1:24 Flight Through Entirety is a Doctor Who podcast. 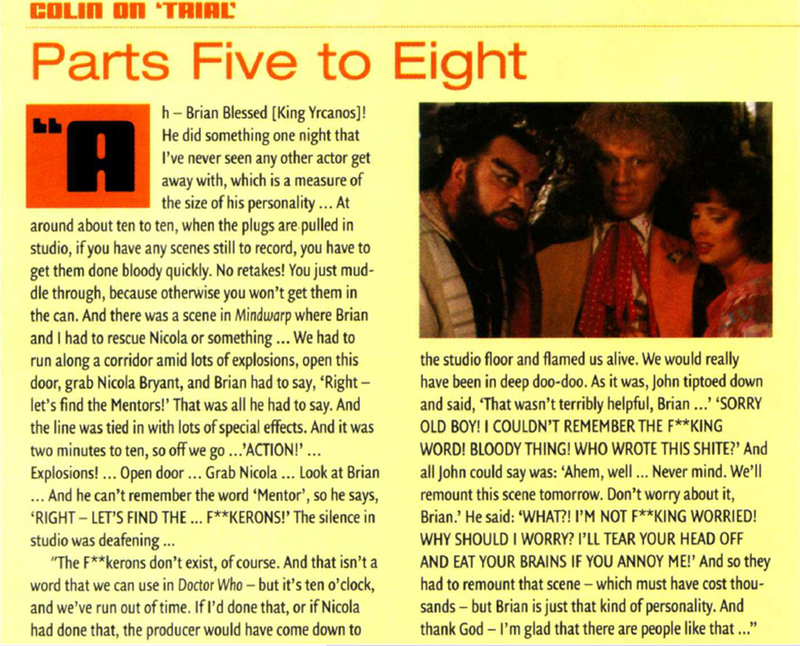 They recorded Eric Saward’s scrapped ending for Trial of a Time Lord about a year ago. 6:12 Dark Star. It actually came out in 1974 and was made by USC students. 7:00 Portal is a video game. 8:00 Check out our Doctor Who podcast Trust Your Doctor for “riveting” Doctor Who discussion that sets a new standard for Doctor Who podcasts. 9:03 Tay was Microsoft’s racist Twitter bot. 35:57 Foundation is a book series by Isaac Asimov. 38:45 Blinky Bill is apparently an Australian classic kids’ book. I’ve been watching the 90s cartoon version lately. 47:40 Here’s the site. Lot of other cool Blake’s 7 stuff on here too. I’m gonna check this out more in depth when I get the chance. 59:42 The Old Doctor Who Show is another Doctor Who podcast. They also make a bunch of gifs from classic DW episodes and post them on Twitter.